Cornwall, Ontario – Job seekers will have a chance to meet employers up close and personal at the Cornwall and Area Job Fair in September. The Job Fair will be held at the Cornwall Civic Complex on Wednesday, September 13 and is being organized by the Social Development Council (SDC) Employability Network. This event is free and open to anyone seeking employment or volunteer opportunities in Cornwall, Stormont, Dundas, Glengarry, and Akwesasne. Both sessions will feature Cornwall, SDG, and Akwesasne employers from various sectors including transportation, warehousing, service and sales, retail, hospitality, and social services. This is the third consecutive year that a Job Fair has been in Cornwall. The Job Fair will also include the 11th annual “Frontline FYI”, a community service fair for frontline workers and those interested in volunteering in the community. “Expanding on the success of last year’s event, we are excited to include the Frontline FYI as a way for social service agencies to find volunteers who are looking to enhance their work experience,” says Mr. de Wit. This event is being organized by the Social Development Council of Cornwall and Area – Employability Network, and sponsored by the Ministry of Community and Social Services in partnership with the City of Cornwall, Cornwall Economic Development, and the Akwesasne Area Management Board. 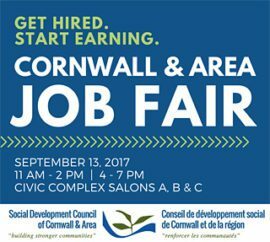 For more information and to register, job seekers, volunteers, and employers are encouraged to visit http://sdccornwall.ca/jobfair2017/.